he Parrot AR.Drone 2.0 is expensive ($299) and can only fly for 15 minutes on a charge, but it’s still a leading contender for the best Father’s Day gift you might ever buy. 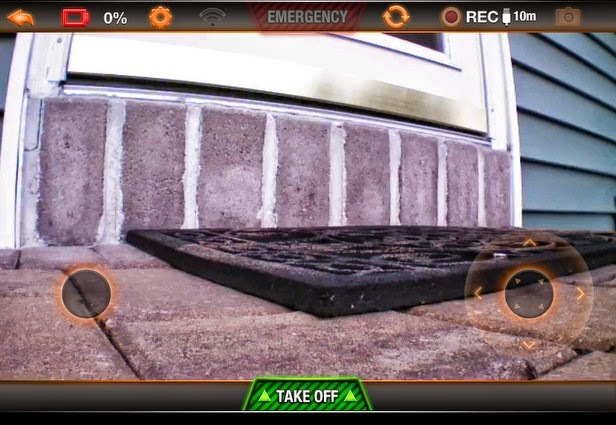 When I tried out the new AR.Drone earlier this year, I sensed its entertainment value, but it wasn’t until I brought it home and took it for a bunch of real test flights that I discovered the compelling nature of this remote-control flying and HD video-recording entertainment device. It’s best described as your own personal spy drone. The AR.Drone 2.0 is the follow-up to the widely discussed AR.Drone 1, which made a splash a couple of years ago as a unique iPhone-controlled quadropcopter. The best part of it? 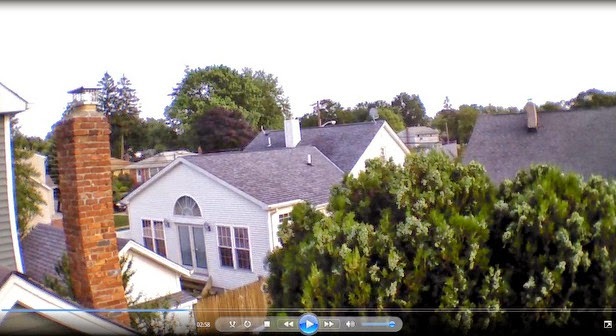 You could see what the AR.Drone’s standard definition camera saw. The copter responded to the on-screen flight controls. Today’s AR.Drone sports two cameras: a standard-definition camera in its belly that points at the ground and a 720p HD camera. 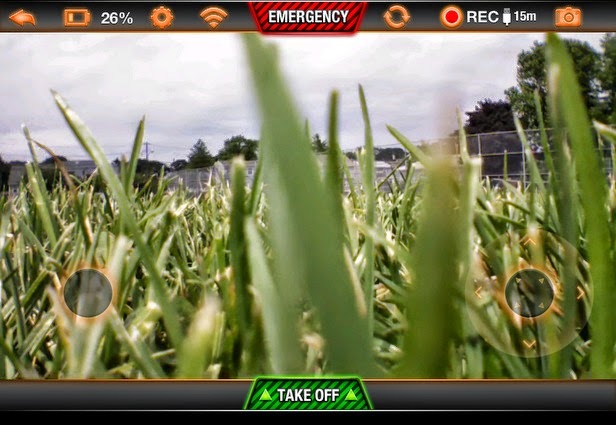 That camera not only shows you what the copter sees, but also lets you capture HD video files on your smart phone or tablet (iOS and Android devices). Setting up the AR.Drone 2.0 is easy enough. It comes with two bodies; one with protective foam rings for indoor flights (they’ll protect your plants, furniture, small children and pets from the largish rotor blades), and a leaner body for outdoor flights. Under the hull (which is held in place by a strong magnet) is the rechargeable battery and a USB port (more on that later). There’s a wall-wart battery charger — you need to charge the battery for about an hour and a half. The flyer ships with a quick-start guide, but the full manual can only be found online. That guide was far more helpful than the thick quick-start guide that devotes 80% of its pages to other languages. The software you’ll need to control AR.Drone, AR.FreeFlight 2.0, is freely available for download via the App Store and Google Play. You can’t fly the AR.Drone until you connect it to your smartphone or tablet via Wi-Fi (802.11A/B G and N). This, too, is easy. The AR Drone shows up as a Wi-Fi hotspot. Unfortunately, once you’re connected to the AR.Drone, your Wi-Fi is not connected to anything else (your smartphone and tablet’s 3G or 4G will be working just fine, though). Once the connection is set up, you can open the AR.Freeflight 2 application and start to fly. AR.Drone is equipped with a fair amount on intelligence to make this less daunting than it appears. The Drone knows its altitude, its position relative to your phone or tablet, and speed (up to 1000 millimeters per second). 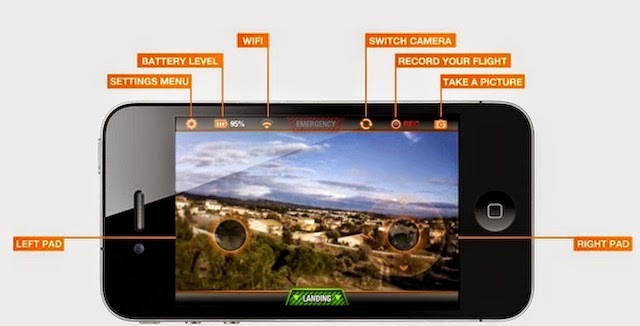 Plus, the Freeflight 2 app makes it pretty easy to control the AR.Drone 2.0’s precise movements. 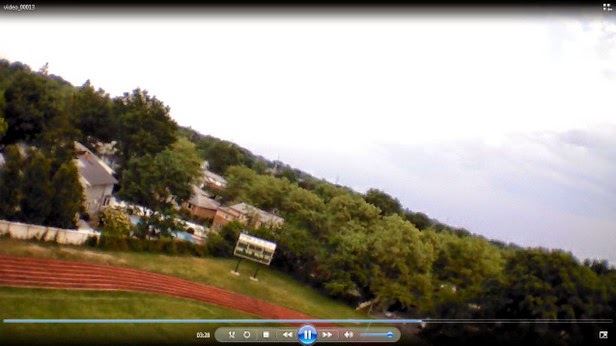 I tapped the large green “Take off” button on the screen and the AR.Drone 2.0 lifted about three meters off the ground. Indoors, I quickly found that there really wasn’t enough room to fly the quadrocopter. The AR.Drone will hover patiently in one spot until you take control. The right thumb stick controls which direction the drone points and its altitude. It’s the easier of the two controls — a move of your thumb to the right, for example, and the AR.Drone smartly turns 90 degrees to the right. Once you’ve spent enough time flying the drone, you get used to turning it slowly in any direction, all by shifting your thumb. AR.Freeflight 2.0’s left-side control takes more, well, finesse. As soon as you place your thumb on that circle, the accelerometer in your phone or tablet is controlling the movement of the AR.Drone. The sharper your moves (tilting forward and back and left and right), the faster the copter moves. If you tip hard, the copter tips and its four blades send it whizzing forward. You have two ways of controlling the copter in this manner: through your device’s accelerometer or in Joystick mode. The latter replaces the accelerometer with an on-screen virtual joystick, makes the control relative to your position and actually makes the drone ten times easier to control. Getting good at flying in any mode takes practice. I’d say that by my fourth flight, I felt like I had the knack of it. But good flying is not the best part. 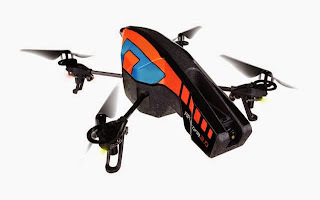 Yes, sending the AR.Drone 2.0 up to 100 meters in the air (the default is just three meters) is exhilarating, but also terrifying because a good wind could take the quadrocopter away and out of your control. (Keep in mind that you’re connected to it via Wi-Fi, which is good for about 300 ft.) However, it’s what the drone can do when it’s up in the air that’s impressive. It can record everything in sharp, wide-angle 720 P video. That MPEG 4 video will either stream directly to your phone or tablet (provided they have the on-board room) or to an under-the-hull USB key (which plugs into the USB port I mentioned earlier) that can fly with the AR.Drone. While the AR.Drone is way up there you can fly around, turn it 360 degrees and even perform a flip maneuver. I did all this and recorded everything. The video looks great. Video recorded with the SD base camera was just so-so however, and I rarely used it. You get just 15 minutes of flying time before the AR.Drone runs out of juice. As you fly, AR.FreeFlight 2.0 beeps to warn you that you’re running out of power (you can also see the percentage remaining on the screen). When you get close to 0% remaining, the AR.Drone will take over and land the quadrocopter before it runs out of power and crashes. You can also simply hit the large, green “Land” button and the AR.Drone will gently lower to the ground. Ultrasonic sensors tell it how far it is from the ground so it’s almost never a hard landing. Like I said, the AR.Drone is not cheap. I wish it cost $99, but a sub-$100 flyer would not have the number of sensors, intelligence and companion software found in the AR.Drone. Should the battery life be longer? Maybe, but the flyer likely couldn’t carry a much larger battery and fly the way it does. That battery, by the way, gets very, very hot by the end of a full flight. I wonder what would happen if it could fly longer. There is also the question of what that fast drain will do to the battery life. It would not be great if the battery was done after only a few months. Readers to write their comments in a proper way does not include a vessel and invective not incite social violence, political or sectarian, or affecting the child or family. The comments posted are in any way for the opinion of the site as and does not bear the newsletter any burdens moral or material at all of the comment by the publication.